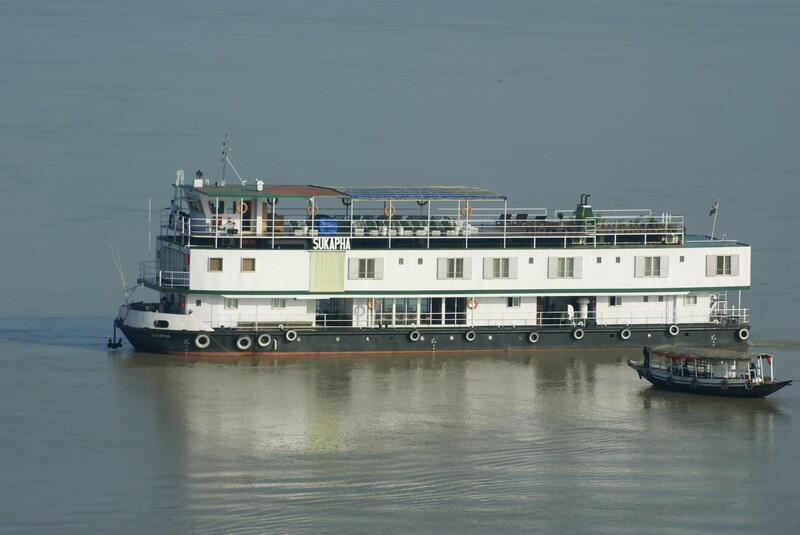 This cruise is perhaps the ideal introduction to the Brahmaputra, finishing as it does with a visit to Kaziranga, the highlight of any visit to Assam. It also includes the rarely-visited Nameri National Park, a visit to a tea garden, and a trip through the bazaars of Tezpur in cycle rickshaws. Day 1. Met at Guwahati airport and taken on a short sightseeing tour of the city. Drive up Nilachal Hill to see the holy Kamakhya temple. With its tantric rites and animal sacrifice, the more squeamish may prefer to content themselves with the exterior. Visit the poignant Commonwealth War Graves cemetery before embarking on your cruise vessel. We set sail and cruise for about an hour and a half upstream to Kurua on the north bank. Day 2. The day is spent mostly cruising upstream with jungle-covered hills rising on either side, often battling against strong currents. We have time though to pause and visit the north bank village of Khirakata, with its lush green fields of vegetables and corn. Day 3. Leaving the hills behind, we enjoy our first taste of the wilderness experience, sand banks like icebergs on either side. We visit Tullugaon, another bankside village with large sugarcane plantations. We shall see weavers at work in their homes, as well as the production of jaggary out of sugar can juice. We moor for the night in a lunar landscape of sand islands, with hopefully the Himalayas in view and providing a contrasting backdrop in the distance. Day 4. We cruise on to reach Tezpur, where after lunch we visit the 6th century Da Parbatia temple ruins with a beautifully carved portal, then explore the town by cycle rickshaw, stopping at Cole Park with medieval stone carvings saved from sites all over the region, and passing the bungalow once lived in by Alexander Bruce, pioneer of the tea industry. Our ship will be waiting at the town’s waterfront for us to reboard. Day 5. After an early breakfast we drive for some two hours to the Nameri National Park at the foot of the blue hills of Arunachal Pradesh, the old North East Frontier Agency. Here we take a float trip of around two hours duration down the Jia Bhoreli River through the park, with excellent birdwatching (look out for the great hornbills) and perhaps the chance of sighting wild elephant. After lunch we take a village walk before returning to the ship. Day 6. We continue upstream, passing below a seemingly endless new bridge across the vast width of the river bed, to moor at Steemer Ghat (sic), a lovely beach backed by jungle-covered hills. In the afternoon we drive to Kaziranga’s Western Range for a jeep safari and to scan the wilderness from an observation tower. Kaziranga is a World Heritage site and with a population of well over 1000 rhinoceros is the best place in the world to see these beasts. There are also good populations of tiger, wild elephant, sambar, swamp deer, hog deer, wild pig and many other species. Day 7. Disembark pre-dawn and drive to Kaziranga’s Central Range for an early morning elephant ride, the best way to get really close to the rhino and other animals. After breakfast at a lodge, we drive to a Mising tribal village, their distinctive houses raised on piles, then visit a nearby tea garden to see how tea is grown and processed (the factory though will be inoperative between December and mid-March). After lunch either take a jeep safari in the little visited Eastern Range before returning to the boat, or if preferred return directly to Steemer Ghat, visit a delightful Assamese village nearby and walk along a path alive with butterflies to a solitary temple on the river bank. Day 8. An early start for the 4 hour drive back to Guwahati airport, or alternatively we can arrange 40 minute transfer to Tezpur airport or 2 ½ hr transfer to Jorhat airport.